U.S. federal investigators searched an apartment in the suburban Boston town of Revere in the effort to find whoever was behind Monday's twin bombings at the Boston Marathon. At least three people were killed and more than 140 others injured. Investigators removed items from the apartment. No arrests have been made, and authorities are not commenting about any potential suspects. The Federal Bureau of Investigation (FBI) is leading the multi-agency effort to investigate what a White House official said was "clearly an act of terror." Two police officers walk down Boylston Street, away from the finish line of the Boston Marathon in Boston, Massachusetts April 16, 2013. Two bombs packed with ball bearings tore through crowds near the finish of the Boston Marathon, killing three people. The explosions happened moments apart, within about 100 meters of each other, near the finish line. No one has claimed responsibility for the blasts. President Barack Obama said those responsible will be found and held accountable. "We still do not know who did this or why," Obama said in a televised statement. "And people shouldn't jump to conclusions before we have all the facts. But, make no mistake, we will get to the bottom of this, and we will find out who did this. We will find out why they did this. Any responsible individuals, any responsible groups, will feel the full weight of justice." Early Tuesday, investigators were working in a wide area around the bombing scene. Heavy security was evident around the city, but otherwise the streets were mostly empty of people. Location of the marathon finish line in Boston, Massachusetts, where two deadly explosions occurred. VOA correspondent Carolyn Presutti described the scene around the bomb sites. "Beyond those barriers, you have everything strewn in the middle of the street. You have blankets, you have makeup, you have gloves, you have food, you have bottles, just everything - Gatorade - everything was left right where the spectators were," she said. "It is almost as if, you look at that scene and you realize that something tragic happened there, that people left extremely quickly, and they didn't even care about what they let in their wake." Boston Police Commissioner Edward Davis said there was "no specific intelligence" warning of an attack. The Boston Globe, citing two law enforcement sources, reported that the dead included an eight-year-old boy. A number of victims suffered amputations. The blasts took place about four hours into the race, long after the winners had finished, but at the time a high number of runners and their supporters are usually around the finish line area. The competition, which attracted more than 23,000 runners from around the world, was halted after the bombs went off. Azeem Khan, a Pakistani-American runner who was three miles from the finish line at the time of the explosions, said it had been a "joyful day" up until then. "Running the race, it was such an amazing experience," Khan said. "The joy of the people is what helped me keep going when I was so tired and how everyone was out. The entire state of Massachusetts was out. Little kids, even if they weren't part of the marathon staff, little kids hanging around with Dixie cups and people who baked cookies for us, and people were handing out food and telling us to keep going and giving us handshakes as we were running. It was just such a joyful day, and to turn such a joyful day into massacre like this, just can't help you but feel anything but anger." 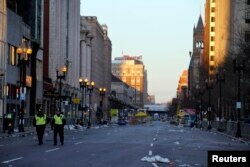 Cities worldwide stepped up security following the explosions. In Britain, police said they are reviewing security plans for Sunday's London Marathon, the next major international marathon. New York City officials said police have increased security in the city, including near prominent hotels, in response to the blast. Washington, D.C. and Los Angeles also are on a heightened state of alert. Officials in Boston said an electrical fire that broke out at the John F. Kennedy Library a few kilometers from the marathon's finish line was not related to the bombings. Shortly after the explosions, the U.S. Secret Service shut down Pennsylvania Avenue outside the White House, cordoning off the area with yellow police tape. But the White House is not on lockdown. President Obama called Boston Mayor Tom Menino and Massachusetts Governor Deval Patrick and told them his administration will provide whatever assistance is necessary in the investigation and response. Boston is a major metropolis located in the northeastern U.S. The marathon, a significant event the city hosts every year, corresponds with the annual Patriot's Day holiday and attracts runners and spectators from all over the world.